Sullivans Island has been a laid-back, sun-splashed playground for residents of the Lowcountry and beyond for more than a century. Before that, the island played pivotal roles on the stage of American history, and, for a short time, captured the imagination of one of America’s most prolific and enigmatic writers. In 1776, at the start of the American Revolution, when seemingly unstoppable British naval forces attacked the fledgling fort at the island’s southern tip, they were repelled by colonists under Col. William Moultrie. And as the impending Civil War approached, federal troops abandoned Fort Moultrie, named for its Revolutionary War commander, for what they thought would be a stronger position at Fort Sumter in Charleston Harbor. The following April, Confederate guns pounded Sumter into submission, plunging the young country into a brother-against-brother war that would drag on for four more brutal years. Between the two wars, Sullivan’s Island was home to a soldier who had not yet reached his 19th birthday when the Army assigned him to Fort Moultrie in November 1827 and had, for whatever reason, signed up for military duty under an assumed name. 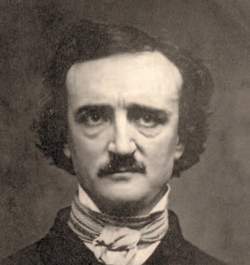 Edgar Allan Poe, America’s master of the macabre, had already published his first book of poetry when he enlisted as Edgar A. Perry. Poe’s formal education was interrupted when he was booted from the University of Virginia, apparently after running up heavy gambling debts. He spent 13 months at Fort Moultrie before cutting short his five-year enlistment and enrolling at the United States Military Academy. A year or so later, he was dishonorably discharged from West Point. Poe died in Baltimore in 1849. Though he was only 40 when the curtain closed on his life and though he spent only 13 months on Sullivan’s Island, his legacy remains. Three streets, Gold Bug Avenue, Raven Drive and Poe Avenue, hark back to him and his works, and Gold Bug Island, across the Intracoastal Waterway in Mount Pleasant, is another testament to the eternity of his writing and poetry. And Poe’s Tavern on Middle Street, also named in his honor, offers fare reminiscent of the island’s early years. The menu includes hamburgers with names such as Gold Bug, Pit & Pendulum, Annabelle Lee, Tell-Tale Heart and, a fitting tribute to Poe’s time on the island, Starving Artist.